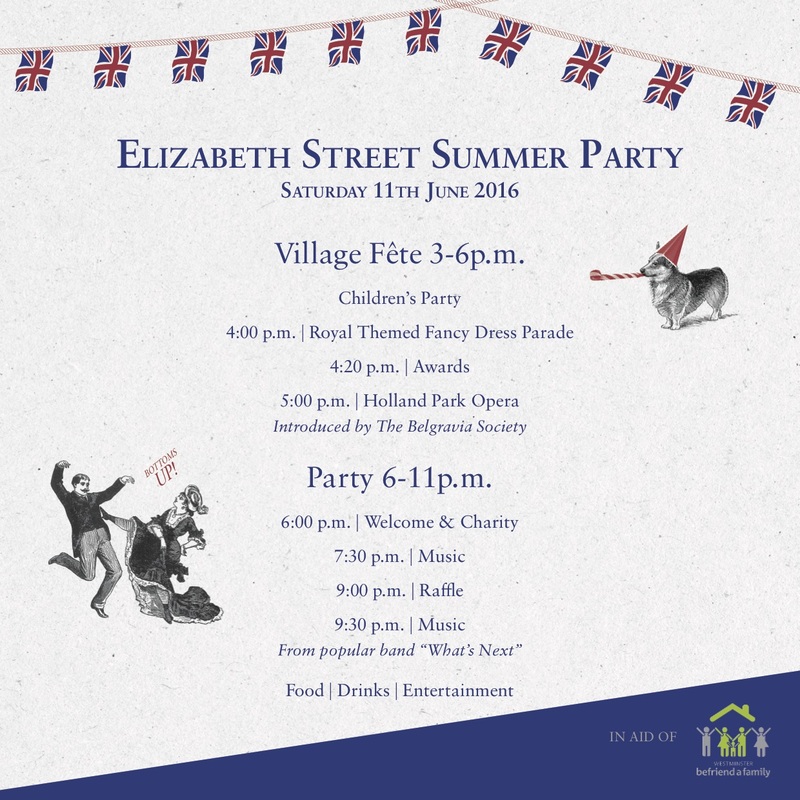 Join us tomorrow at the Elizabeth Street Summer Party 2016! Where: Elizabeth Street, London, SW1W. A 5 minute walk from Victoria Station. Please come and join us tomorrow at the Elizabeth Street Summer Party from 3-11! There will be food, drink, a fancy dress parade, entertainment, a performance by Holland Park Opera, live music and lots more! There is a suggested £5 donation to Westminster Befriend a Family for attending on the day and we would really welcome your support. So please come along and enjoy what promises to be a wonderful occasion. If anyone is interested in volunteering on the day then please contact Chris Davis at chris@befriendafamily.co.uk or call 0207 828 2765 for more information. And a huge thanks to Cubitt House, the Belgravia Traders Association, the Belgravia Society and Twenty Two Events for all their hard work in organising this event and the amazing support they have shown to the charity. We would also like to thank all the sponsors who made the event possible, with special thanks to the title sponsors the Harbour Club, Grosvenor and Cubitt House.